Spring, Texas – February 11, 2019: Time to take a ride around town and try the seven best (we think) burgers that Spring has to offer! We sent our team on the hunt for the best and here is what they found. Make sure to mention Spring Happenings when you go try these out! When you arrive and begin to order at the 5 Ate Café you have got to try the Sweet & Smoky. The patty is covered in provolone, smoked cheddar cheese, semi dried cherry tomatoes, and grilled onions. 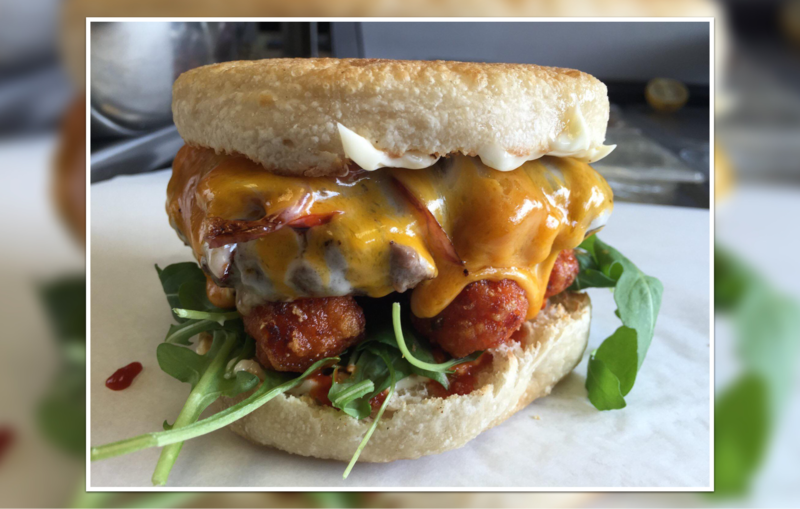 It comes with the perfect condiment of sriracha mayo on top of crispy sweet potato tots and a sprinkle of baby arugula. All of their burgers are served on house made English muffins and come with a side salad or French fries. Sweet & Smoky burger at 5 Ate Café. We’re in the great state of Texas so that means one thing and one thing only: try the Texas Burger. It comes with a half pound patty, mustard, lettuce, tomato, onions, chili, grilled jalapenos, and cheese. For a side try the Cajun fries with their special Cajun seasoning and wash it all down with an Oreo cookie shake. You won’t be disappointed. What should you try at a place named Woodson’s? How about the Tri-Blend Burger named after its namesake! The burger is served on a half pound patty with a bacon jam, mac and cheese, bacon, and fried onions on your choice of bun. If you feel like some specialty fries the Magnolia Fries are the way to go: house smoked brisket, fried onions, fried pickles, bbq sauce, and queso. For those 21 and over we also recommend the Blood & Honey, a pale wheat ale originating in Granbury, Texas. There’s no doubt that once you try Woodson’s you’ll be eager to go back. Nothing in the world beats building your own burger so that’s exactly what we did at The Omega Grill. We decided to go with a bison burger on a nice, brioche bun, topped with provolone cheese, and adding peppered bacon and grilled onions. Obviously we couldn’t go without adding a side so we upgraded to a premium side of sweet potato fries to round out the meal. Don’t forget to go to Happy Hour on Monday through Friday for $3 craft drafts and domestics, $1 off a glass of wine, $5 off bottled wine, and $1 off all appetizers. It’s the perfect spot for a first date, happy hour with the girls or guys, or a nice family dinner. Time to go exploring the land of down under and try the Aussie Burger! The Aussie comes with a half pound hand crafted beef patty, bacon, caramelized onions, pineapple, fried egg, and picked beets. Their burgers come topped off garnished with lettuce, tomato, red onions, and a pickle. As a side, try their oven baked fries. The Aussie Burger at Palava. Receive 15% OFF on any food purchase of $10 or more. Terms: One coupon per order. OFFER VALID FOR FOOD PURCHASES ONLY. Valid until February 28, 2019. Work with us here because this is more sandwich than straight up burger, but it still stands on its own merit: The California Club. The California Club is stacked with piled high Cajun turkey and thick cut bacon, sliced avocado, lettuce, tomato, with honey mustard and Swiss cheese on a nice wholegrain berrywheat bread. We recommend the hashbrown casserole; although the potato salad, side salads, or soup of the day are a great way to enhance the experience as well. The Toasted Yolk also has a nice choice of different flavored mimosas to wash everything down your meal. Time to mix it up a bit and try the Southern Chicken Fried Chicken Burger. The chicken burger comes topped with a delicious white pepper gravy, lettuce, tomatoes, red onions, pickles and mayonnaise. Served on the side are French fries and some apple cranberry coleslaw. Southern Chicken Fried Chicken Burger at Cast Iron Southern Grill. Which “best of” list would you like to see next? Click here to send us your ideas here.